Driving the Audi RS3 Sportback is a bit like driving a refined missile through the countryside. Potent power is instantly accessible, and the taut ride and full-time Quattro drivetrain keep the compact hatch in control of its destination. 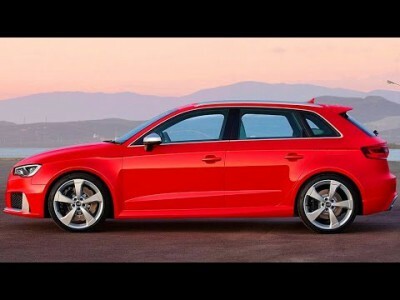 For sheer driver enjoyment in a quality package, the Audi RS3 Sportback is a hard buy to overlook. The car is priced similarly to a Mercedes-Benz A45 AMG and boasts comparable power. Audi has improved on the outgoing model, with a great blend of ride comfort and sport potential. There is no mistaking that the car has some hairs on its chest, with 19-inch wheels tucked beneath some great looking flared wheel arches. At the front end, the RS3 Sportback sports a glossy black grille, and the low profile lines give the car a squat stance over the road. Walk around to the rear of the vehicle, and the rear end is nicely finished off with a tidy set of taillights, a roof spoiler and some pretty big sports exhaust outlets. The sharp crackle from the engine and exhaust outlets sends shivers down the back of your spine – not to mention the quiet country roads. What plays the game is a highly rated 5-cylinder engine pumping out an impressive 270 kW of power. The turbo-charged 2.5-litre motor has colossal torque from low down and at its maximum level will throw a full 465 Nm of torque down on the tarmac. Part of Audi’s weaponry sees the engine with a new intercooler and a fettled turbo to boost up the power and torque. 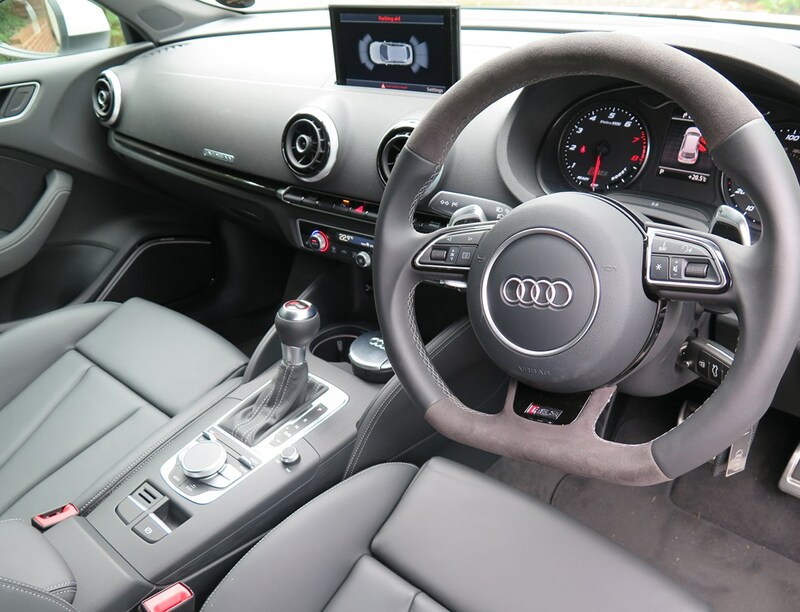 Given the power is applied to the road via a seven-speed dual-clutch auto and paddle shifters, it’s little wonder that at full throttle the RS3 Sportback can blitz the 0-100 km/h dash in a bit over four seconds. Top speed is somewhere in the vicinity of 270 km/h. On the open road, the blend of shatteringly fast acceleration and exhilarating AWD road holding needs to be experienced to be believed. Massive 370 mm front disc brakes clamped by eight piston callipers help ensure that the stopping power is equally good. As with the best sports orientated cars, they are equally good at getting the mundane jobs of getting the kids to school, heading off to the office and helping in topping up the pantry cupboards after a grocery trip. The Audi RS3 Sportback is happy enough trickling along a congested city street. In the real world, the RS3 hatch is capable of sub 10 litres/100 km fuel averages. That’s with the odd blast along a back road thrown in, too! Inside the Audi RS3 Sportback there is a typically Audi finish about the cabin. Impeccable build quality and comfort are hallmarks of Audi. Nice hints toward the interior being RS3 flavoured are evident with RS3 logos and hints of red about the detailing. The Alacantara sports seats are excellent, while the flat-bottomed Alcantara leather-covered steering wheel settles nicely into your hands. Luggage space is a little on the small size, at 280 litres; though this grows when the rear seats are folded flat. Rear seat room is good, and you’ll find that you can comfortably seat four adults in the RS3 cabin. You get a heck-of-a-lot-of car for the price, and some of the cool features include: 270 kW, 270 km/h, 19-inch alloy wheels, an anti-theft alarm with interior surveillance, magnetic ride damper control, the RS sports tuned suspension, a rear-view camera, dual-zone air-conditioning, aluminium roof rails and auto LED headlights. For a car that packs a punch above its weight, the 2016 Audi RS3 Sportback is the car for the long drive between Australian States. Always ready for a hoon, but all done in stylish luxury, the Audi RS3 is a very satisfying car to drive. For any more information on the Audi RS3 Sportback or, for that matter, any other new car, contact one of our friendly consultants on 1300 303 181. If you’d like some fleet discount pricing (yes even for private buyers! ), we can submit vehicle quote requests out to our national network of Audi dealers and come back with pricing within 24 hours. Private Fleet – car buying made easy!